Qualcomm has recently launched the Snapdragon 710 as an updated version of the Snapdragon 660 SoC. The Snapdragon 710 is the first SoC in the all new Snapdragon 700 series. It seems that the U.S.-based chip maker is still not done yet with the Snapdragon 600 series as a mysterious Snapdragon 680 SoC has been found listed on Geekbench. 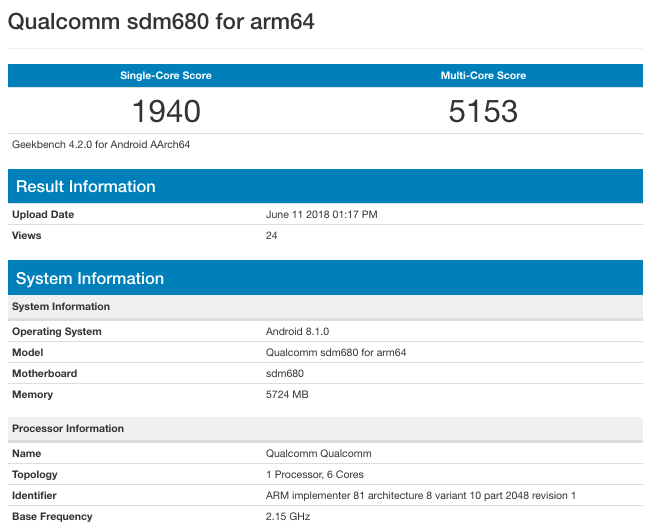 Following is a screenshot of Qualcomm’s test device that is running on the unannounced Snapdragon 680 mobile platform. In single-core and multi-core tests, the test device has scored 1940 and 5153 points. The SD680 chip on the test device is supported by 6 GB of RAM and it is running on Android 8.1 Oreo. The above scores suggest that the Snapdragon 680 sits between Snapdragon 710 (18XX | 60XX), Snapdragon 660 (16XX | 5970) and Snapdragon 630 (8XX | 41XX). The Geekbench listing also that the SD680 is a hexa-core SoC that clocks at 2.15 GHz. After the Snapdragon 650, the Snapdragon 680 seems to be the second hexa-core SoC in the Snapdragon 600 lineup. The single-core score of the new SoC is almost similar to SD835 SoC that powered flagship phones in 2017. Hence, it seems that the Snapdragon 680 is a powerful chipset that is designed for upper mid-range smartphones. The Xiaomi Mi 8 SE is the first smartphone to feature the new Snapdragon 710 chipset. The Vivo NEX phone that will be launching today could be the next handset to be driven by the same SoC. It is an octa-core chipset built with 10nm architecture. Some of its key features include Artificial Intelligence Engine (AIE), 3D depth sensing, Cat. 15 LTE and QC 4.0+ fast charging support. The Snapdragon 680 chipset could be 14nm SoC like the SD660. As of this writing, there are no rumors available on the phones that will be powered by it. Also, there is no news on when Qualcomm will be launching the mysterious SoC. Xiaomi Confirmed Mi 8 is going to be Launched on 31st May! !